Welcome to the Efficient Buildings & Renewable Energy MED Community Conference, organized in the framework of the Interreg MED Programme. The conference will take place in Ljubljana (Slovenia) the 18th and 19th of October. It will host the partners of all Interreg MED Modular Projects from the two Thematic Communities: Efficient Buildings Community and Renewable Energy Community. At this moment, the projects are in the mid-term of their overall performance and the conference will present their on-going results to experts and strategic institutions with the objective of exchange opinions about their technical approach and their contribution to regulatory framework. The conference is organized with the support and in the presence of the EU Director General for Energy. 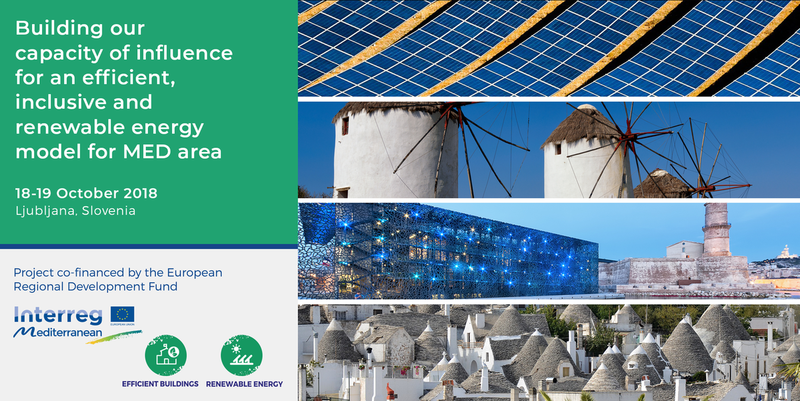 The conference welcomes all who work on energy, within the fields of energy efficiency in buildings and renewable energy, in local governments, in national authorities, but also politics, businesses, industry and NGOs. Show projects’ solutions for an efficient, inclusive and renewable energy model in the Mediterranean area. Meeting of experts from energy/environmental sector to explore new synergies, share best practices and innovative ideas. Formulate recommendations for the improvement of the energy sector in the Mediterranean area. Meeting of decision makers to share political news, information and ideas, especially for goals and activities post-2020.